This entry is part 8 of 13 in the series Starfleet Academy. Merry Christmas, everyone! Here’s your present from me: another post about my made-up Star Trek series, Starfleet Academy! Just what you always wanted, right? Up until now, we’ve been talking about the main characters of my little fanfiction project, namely a TV show entitled “Starfleet Academy.” We’ve got Kamlyn Sulu, a driven cadet trying to live up to his family’s reputation. There’s Jessa Atin, the first-ever Cardassian to enroll at Starfleet Academy in spite of the hatred and anger she encounters there. We have Herschel Williamson, a genius from the 21st century trying to find his footing in the 24th. And Naomi Wildman would make a comeback too! But obviously Starfleet Academy is more than just four students. There would be other students in the same in-coming class. There would be upperclassmen who are further along in their academic career. There would be new students coming in season after season. While the main cast would remain constant (maybe), there would have to be an ever-evolving cast of secondary characters who come and go. Some would fail out. Some would graduate. Some could even die. Like Kam, the BBoC is a Starfleet legacy. I’d personally make him a descendant of Captain Styles, but that’s just me. Like Kam, the BBoC lost family and/or friends in the Dominion War. But whereas Kam is a good person, the BBoC is not. He is an upperclassmen when our heroes arrive and he has quite the cloud of followers and lackeys who have fallen under his sway. For whatever reason, the BBoC dislikes Kam. He despises Jessa. And he thinks of Herschel as a bumpkin. If this were the ’80s, he’d totally be played by Billy Zabka. Eventually, Kam and his crew would have to go head-to-head with the BBoC. At first, our intrepid heroes would lose and possibly badly. But eventually, they would wear down his defenses and displace the BBoC. It’s possible that the BBoC would eventually see the error of his ways and become a decent person. But I’d rather imagine that he doesn’t. It’s not that he’s irredeemable. He’s just incapable of overcoming his personal inertia. Or he could wind up dead. I’m good either way. We’ve seen in previous Star Trek shows that Starfleet is all about cooperation and sharing of information. There were the cultural exchanges in TNG. I suspect that the higher-ups dissected the interaction between the Starfleet and Maquis crewmembers for decades after Voyager returned. If there’s a way to learn from each other, Starfleet is going to jump at it. So I think it only makes sense that the Federation would try a cultural exchange program with the Romulans. Naturally, not everyone would think this is a great idea. Sure, the Federation and Romulans have been allies since the Dominion War, but no one can ever be sure of what the Romulans are up to. So while some people welcome the Romulan student, others would keep her at arm’s length. As a Romulan, she would naturally be a little aloof and reserved. Eventually, she would find her niche and people that accept her. She might even find some true friends. That could be problematic, especially if she has a hidden agenda. And since she’s a Romulan, there’s a good chance that she does. I actually had this idea before I came up with Herschel. Maybe one of the students would come from a race that has recently joined the Federation. While the rest of her race is a touch xenophobic, she’s a rare exception. She’s longed to leave their home and now, she’s gotten her chance. She wants to prove not only herself, but also show that her people are worthy to belong in the Federation. And along the way, she’d learn what it means to be a part of a larger community even as she struggles to understand her new friends and allies. Even though Herschel is filling the “fish-out-of-water” role in my “show,” I’d still want to include this character, possibly as a romantic interest for Herschel himself. I think if these two met up, they would find a kindred spirit in one another. One of the criticisms that is often leveled at Star Trek shows is the whole “humans with bumpy foreheads” business. It would be interesting, I think, if there was a castmember who wasn’t a humanoid at all but comes from a race that is completely and totally different. I’m thinking something along the lines of a Xindi-Aquatic or a horta or something like that. Obviously this classmate couldn’t be in every episode due to budget concerns, but it would be cool to have someone the others sometimes hang out with, someone who would have a completely alien take on whatever they were experiencing. Since Starfleet Academy is a school, there would have to be instructors. Now I’d be tempted to try to shoe-horn in a lot of Star Trek vets into these roles. Wouldn’t it be cool to see Tom Paris and Harry Kim teaching starship design based on their experience with the Delta Flier? Reginald Barclay could teach courses on holographic technology. Or it’d be interesting to see a roundtable discussion on the finer points of xeno-medicine with Dr. Crusher, Dr. Bashir, and the Doctor contributing. But let’s be honest, we probably couldn’t get any of those folks long-term. Although, at the suggestion of one of my readers, I think there’s one former crew member I’d want to see come back as a professor, someone who would maybe have a unique perspective on Starfleet and the Academy, one who most students would maybe expect to have a problem with one of our main characters. I’m thinking Nog would be a great instructor, wouldn’t you? I mean, he served with distinction on the front lines in the Dominion War. He even lost a leg in combat, for crying out loud. He would be an inspirational figure for some of the cadets, someone who overcame impossible odds to become a Starfleet officer. But at the same time, he might face a great deal of prejudice, and not just from the students. It’s possible his fellow instructors might not trust him, simply because they’ve had bad dealings with Ferengi in the past. The fact that he’s the son of the Grand Nagus wouldn’t help matters either (since most Starfleet officers probably wouldn’t be interested in the nuances of Ferengi politics and wouldn’t be aware of the reforms that Rom is spearheading). Maybe they’re worried that Nog’s loyalties can be bought for a couple of strips of latinum. And maybe some of the cadets will assume that Nog will have problems with Cadet Jessa Atin. She’s Cardassian, and maybe they’ll assume that Nog will give her a hard time since her people are responsible for him losing a leg. As a matter of fact, when I started thinking of Nog as an instructor, a whole plotline for an episode started forming in my head. It would take place early in the series, shortly after classes have started. Jessa has had a hard time fitting in and is constantly getting harassed by the other cadets. Kam and Herschel are bothered by this situation, but at this point, they’re not willing to intervene for their own selfish reasons. The only one motivated to act is Naomi, but she’s only one voice and easy to ignore. Jessa’s tormentors are particularly eager to see how Commander Nog (just picking a rank out of a hat at this point) will react to having a Cardie in class. They even try to engineer a confrontation the first day of Nog’s class. 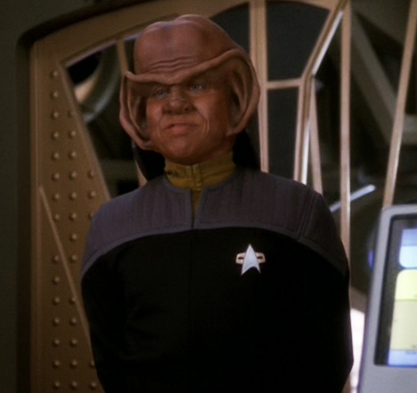 Nog winds up staring down Jessa for a moment before he demands to know which division she served in during the war. Jessa, confused, says she didn’t serve in any. Nog seems confused by this, asking how she served since everyone seems to think that she was there. Jessa answers that she was only a child. Jessa, confused, says that they didn’t. When Jessa answers in the affirmative, Nog shrugs it off and says that as far as he’s concerned, the two of them will have no problem. And as they go forward, Nog turns out to be one of Jessa’s most stalwart defenders. I can envision Nog having that conversation. That could be his voice. His reasons for living in a moneyless society could be interesting, since even though he’s not a good businessman like the traditional Ferengi ideal, I imagine that he still values commerce at an ideological level — “the Great Material Continuum” and such. Ezri Dax? No, that would probably be too fan-y, just like having all the doctors together. Data? Might he be a professor? Is there anything canonical about him? I’m trying to remember where he was in the flash-forward in the finale episode of [i]TNG[/i]. I think poetically, he and the holographic doctor from [i]Voyager[/i] should meet some day — and I don’t think that would be too unrealistic. Maybe that could be a one-off episode — some kind of artificial lifeform symposium or something. Wait, Chief O’Brien moved back to Earth after [i]DSN[/i] specifically to teach at the Academy. I think. You know, another Dax symbiote might be interesting, especially if there’s no explanation about what happened to Ezri. It could be a mystery that would bring people back to the show. As for Data, I’m afraid he wouldn’t work. He died half-way through “Star Trek: Nemesis,” IIRC, only to be replaced by another Soong-type android. I forget what that one was called.